Colt Brennan was held out of practice again yesterday following Saturday's concussion. He is awaiting clearance to play from Hawaii's medical staff. Hawaii quarterback Colt Brennan could see his first action in practice today while recovering from a concussion he incurred against Fresno State last week, coach June Jones said yesterday. Brennan, dressed in sweatpants and a shirt, played a little catch at Hawaii's morning practice but essentially observed his No. 13-ranked Warrior teammates (9-0, 6-0 Western Athletic Conference) scrimmage each other with the team's nationally televised WAC showdown at Nevada on Friday. He will be making the road trip to Reno today. "He's same as (Monday)," coach June Jones said. "No exertion (Tuesday), (he) met with the doctors and he feels fine." Brennan's possible clearance to play is at the discretion of UH's medical staff. Their decision will be announced through Jones at some point, up to and including the 8 p.m. (Pacific Standard Time) game's start. But even if Brennan is cleared to play, that is no indication of whether he actually will. Tyler Graunke and Inoke Funaki continued to receive repetitions in Brennan's stead yesterday. "He's probably cleared right now, but I held him out, get more reps for the other guys," Jones said, adding it was an extra day beyond the "normal procedure" to hold a person out 48 hours after such an concussion. Jones said he doubted running back Kealoha Pilares, the team's leading rusher with 294 yards, would make the trip with his right knee injury. That paves the way for an encore performance from Konawaena graduate Daniel Libre, who went for 61 yards against the Bulldogs in his Division I debut. Receivers Davone Bess, Jason Rivers, and C.J. Hawthorne were back in action after resting various ailments on Monday. UH's Daniel Libre came from out of nowhere to gain 61 yards on the ground last Saturday. Running back Daniel Libre couldn't help but grin at Davone Bess' outburst. Suddenly -- and as seemingly from out of nowhere as Bess' theatrics -- the Konawaena graduate has emerged as an unlikely factor in Hawaii's high-powered offense. The junior displayed fleetness of foot in the Warriors' 37-30 win against Fresno State, going for 61 yards on just six carries to help alleviate the absence of injured Damien alum Kealoha Pilares, who entered the game as Hawaii's leading rusher. Thus, Libre has been getting a little more attention at the team's practices this week, including plenty of ribbing from his teammates. He may not win college football's top award, but Libre got plenty of reps yesterday as the No. 13 Warriors (9-0, 6-0 WAC) geared up for today's road trip to Reno, Nev., where they have never won. The attention -- and playing time -- are foreign elements to the soft-spoken graphic design major, but that might not last too much longer. "Nobody in my art classes believes that I'm an athlete, because just the way I am -- I'm quiet and keep to myself," the 5-foot-8 Libre said with a chuckle. He weaved between blockers and Bulldogs defenders as deftly as he would with a brush in his other hobby, painting and drawing. "Well, it's kind of contradictory," Libre conceded of his various activities. "With the new developments and software and everything I'm just going more toward graphic design. Drawing and painting is still what I love to do, but for future-wise, graphic design's more (promising)." Running backs coach Wes Suan noted another dichotomy about Libre against the Bulldogs. Suan wasn't surprised at the level of Libre's play, but rather his mannerisms throughout the tense rivalry game. "It was a surprise that he played with that calm intensity, which is a contradictory term," Suan said. "But he was in there, he understood what he was looking at, how the play was designed, and where he needs to be position-wise." Libre, who is part-Hawaiian and lived locally early in his childhood, has needed to be in different places throughout his life; his father is in the Army and currently teaches ROTC at Konawaena. The Libres have been stationed in California, Colorado, and even were as far-flung as Germany before Daniel returned to the Big Island for high school. He wasn't highly recruited while playing for the Division II Wildcats, and ended up at Menlo College on an academic scholarship. But he transferred after a semester at the NAIA football school in Atherton, Calif., and his time at a Hawaii training camp paid dividends in landing a spot on a ranked team. "It was a nice atmosphere and everything (at Menlo), but the football just wasn't for me," he explained. 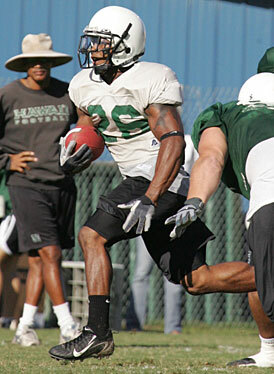 His career at Hawaii wasn't easy to begin with, either, as he was initially placed at running back, then was moved to slotback for most of the season before reverting to his original position two weeks ago, a result of Pilares' knee injury. "It was refreshing and nerve-racking at the same time," Libre said. "I was real nervous; I knew that was my chance to show that I could do what I know I could do, but what the coaches weren't sure of. I just had to take that opportunity and shine. I guess I did good enough where I could play in the games." Consider the canvas a work in progress.